Essential oils add fragrance to homemade body creams, soaps, massage lotions and other cosmetics. Most essential oils are too strong to apply directly to your skin. To avoid irritation, you'll need to dilute them with a carrier oil. You can use almost any vegetable oil as a carrier oil, but some are better for your skin than others. Grape seed oil is lightweight and penetrates skin well. It has slightly astringent properties, so it's useful for acne-prone skin. Grape seed oil is a solid choice for massage oils, too. It's inexpensive, and you can purchase a bottle at almost any grocery store. Coconut oil has a mild, sweet scent, and skin absorbs it well. By itself, coconut oil solidifies at room temperature, so it must be mixed with another carrier oil to prevent this. Olive oil has a strong, nutty fragrance, so it's best used when diluted with another carrier oil. Olive oil works well in homemade soaps and shampoos. Sweet almond oil is useful for relieving dryness, itchy skin or inflammation. It's lightweight and has a mild scent that won't overpower other oils. It works well in aromatherapy massage-oil blends. 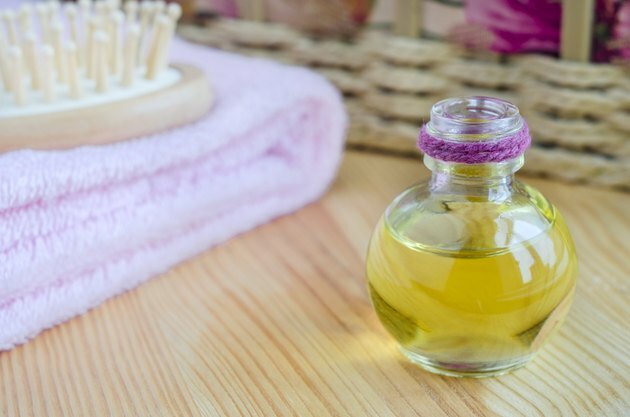 Jojoba oil is a good option for people with sensitive skin. It soothes psoriasis, eczema and other skin conditions. Jojoba oil is a bit more expensive than other carrier oils, though. Use wheat germ oil for mature skin, scar tissue or stretch marks. It's packed with unsaturated fatty acids and vitamins A and E. Wheat germ oil has antioxidant properties, so mix it with other oils to keep the blend from going rancid.